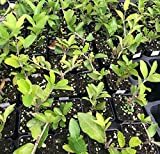 Barbados, Acerola Cherry Tree Plant, Live Plant, Pesticide Free!! Acerola cherry plant for sale – Easy plant to grow with edible fruits, planting in early spring to autumn, better to buy plant, grafted plant or another option to start from seeds yet more challenging. Blooming in the spring to summer in star shaped flowers that appear in pink color. Fruit harvesting in the spring to autumn in round shaped that appear in red color. Acerola cherry tree for sale – What need to know before buying Acerola cherries tree? Acerola cherry tree for sale – need to know before buying that season for planting is the spring possible in the summer, possible to start from seeds but tree ensure the fruit that you’ll get (if it’s graft or start from vegetative) need frost free and when the plant young sensitive for cold winds, attack by aphids and more and grow very crowded so better to prune it for easy pickup.